As we head into Sexual Assault Awareness Month, NJCASA is celebrating our 2016 Social Media Ambassadors (SMA)! 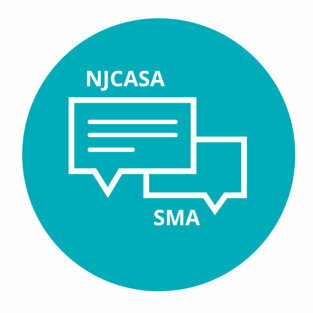 NJCASA’s SMA project harnesses the talent and voices of social media activists looking to increase meaningful discussions to support survivors of sexual violence and create safer online spaces. After a selective application process, NJCASA has identified 6 dedicated individuals focused on informing and engaging communities in NJCASA’s mission-driven efforts. Below you can find more information on the passionate team and be sure to follow #njcasaSMA on your social networks to see what they’re doing! Becca graduated from Connecticut College in 2008 with a major in dance and minors in philosophy and film studies, all of which she still enjoys pursuing in her free time. She is currently a law student at Rutgers University-Newark and is an editor for the Rutgers Women’s Rights Law Reporter. This is Becca’s second year as a Social Media Ambassador for NJCASA. Brielle has a Master’s Degree in Corporate and Public Communication where she wrote a thesis on the motivations of volunteers in sexual assault support advocacy groups and their communication strategies to survivors. Brielle works full time for the NJ Dept. of Labor and teaches as an adjunct professor. What matters to Brielle? Her dog Holly who is like Brielle in dog-form, her ambition to always better and educate herself, and her love to help others. This will be Brielle’s second year as a Social Media Ambassador. Kristen started out in the victim advocacy movement through a random internship placement during her undergraduate studies at Temple University. Little did she know that it would evolve her into a social justice advocate. Kristen completed her Psychology degree and went on to finish a Master’s in Administration of Human Services and is currently working for her local domestic and sexual violence advocacy program. With the free time she has left after a long day of fighting the patriarchy, Kristen likes to hang out with her dog and quietly meditate in the form of binge-watching Netflix. Originally from Nebraska/Iowa, Laurice moved to NYC in 1999 for Broadway and has been in NJ since 2005. She has worked on the creative/administrative/production teams at regional theatres, Broadway shows, and other dance/theatre companies. Last year, Laurice began working as the outreach coordinator for the Unitarian Universalist Legislative Ministry of NJ. Laurice lives with her husband and four-year-old child and spends her free time outdoors or with immersion in congregational life at UU Congregation at Montclair. Laurice has been active as an advocate for the last 12 years. Mariel is a recent graduate of Rutgers University. She is still active on the Rutgers campus as a confidential crisis advocate for survivors of sexual and domestic violence. Mariel plans to go back to graduate school to pursue a Master’s in Public Policy, followed by a Ph.D in Women’s Studies. In her free time, she loves volunteering, writing, cats, and betraying her Nutritional Sciences degree with junk food. Meaghan is currently in her second year of the full-time MSW program at Rutgers New Brunswick and will be graduating with a concentration in clinical social work in May 2016. She’s planning on moving to Philadelphia after graduation to pursue a career in either school or medical social work. She is passionate about advocating for those that are underserved and she hopes to affect change at a policy level through her work. She is also a huge dog lover and is looking forward to rescuing and certifying her own therapy dog as an addition to her practice. In her free time she loves reading, running (she is currently training for her first marathon), and doing anything that gets her outside.